Would you believe that I’ve made it this far and never made anything from Halo?! Crazy, right?! 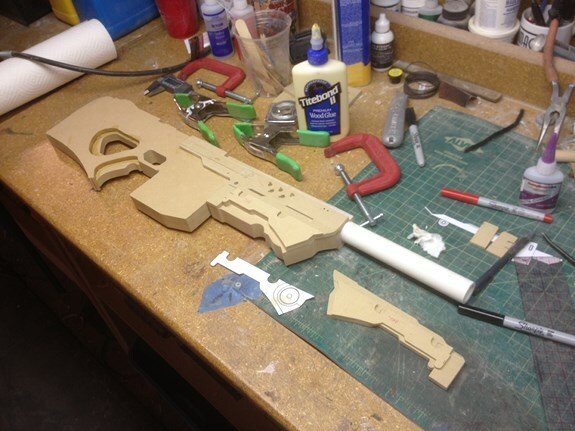 Well that changed this month when I got a commission to build the Sniper Rifle System 99-S5 Anti-Materiel From Halo 4. For an in-depth look into my MDF layering technique, check out my video here. 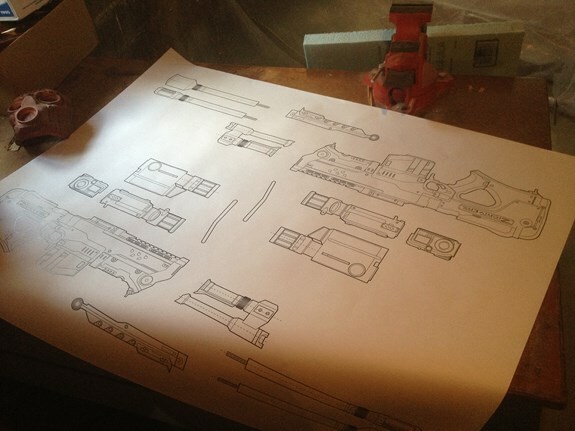 As per usual, I drew up some blueprints and had them printed out full size at Kinkos. 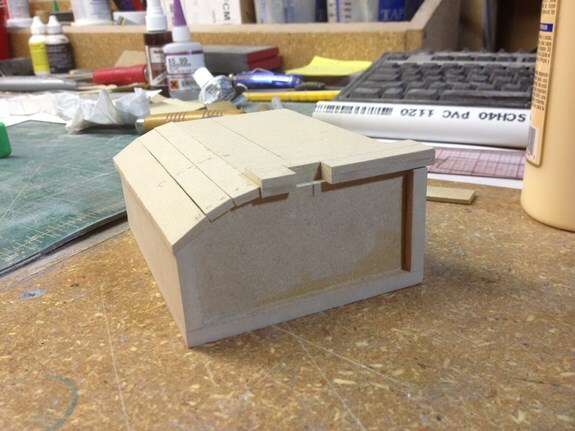 95% of the materials for this build were MDF sheets in various thicknesses. I also got some PVC pipe for the barrel sections. 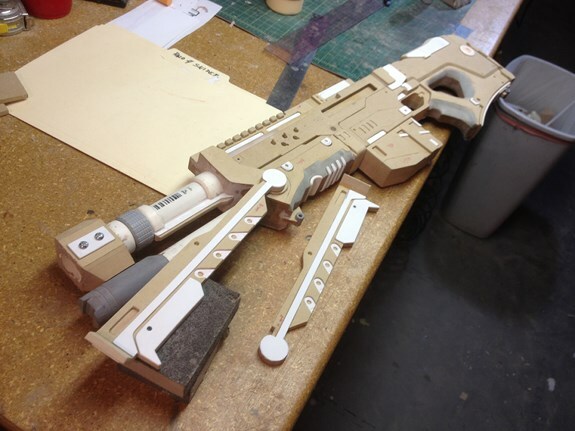 The lion’s share of this gun was made by layering slices of MDF in various thicknesses. Each layer was cut out using my scroll saw. For the barrel section I cut out a trench for the PVC pipe and epoxied it into place. 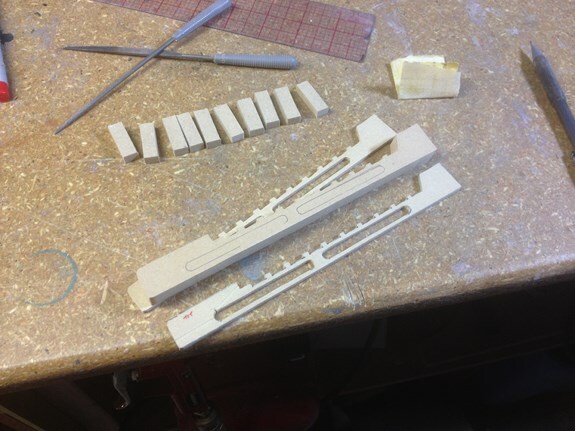 What followed was about a week straight of cutting out shapes in MDF at different thicknesses and wood gluing them into place on either side of the main gun shape. 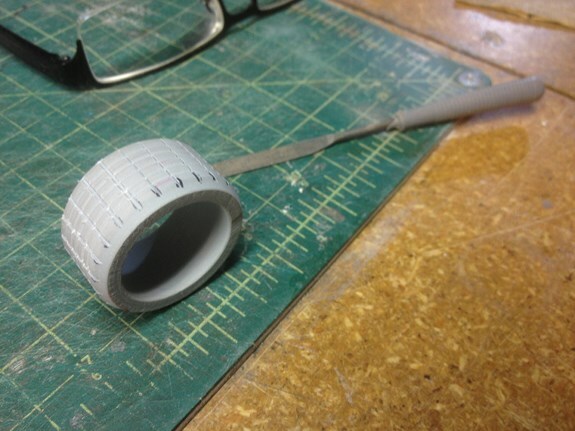 For thinner pieces, I used 1/16″ high impact styrene plastic (the white bits). 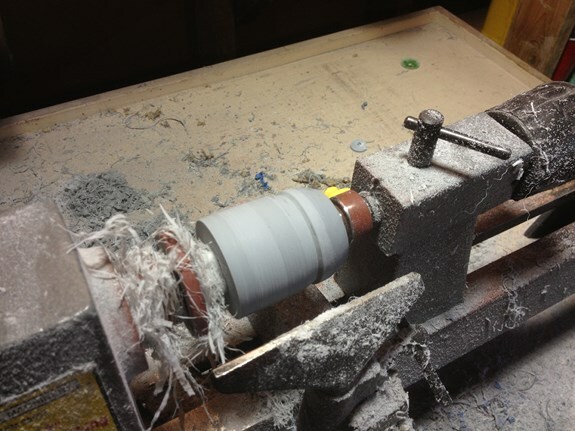 The tapered handle bits were filled in with Apoxie Sculpt. The top rail was a particularly challenging and tedious part. 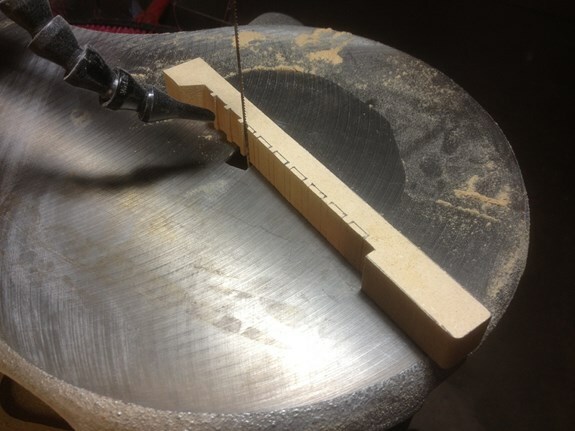 I ended up notching all of the little trenches out with my scroll saw. 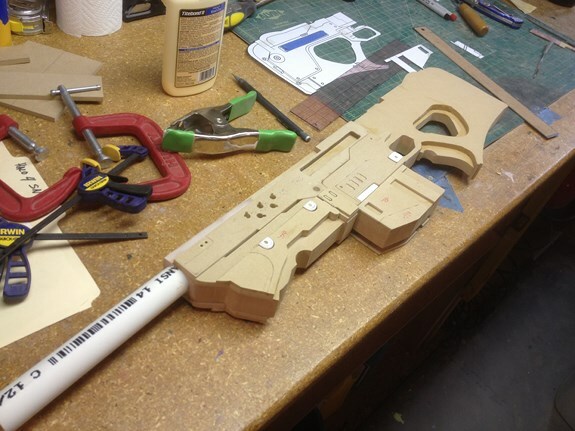 Then I cut out individual rail parts and the side detail parts from more MDF and wood glued the whole shooting match together. 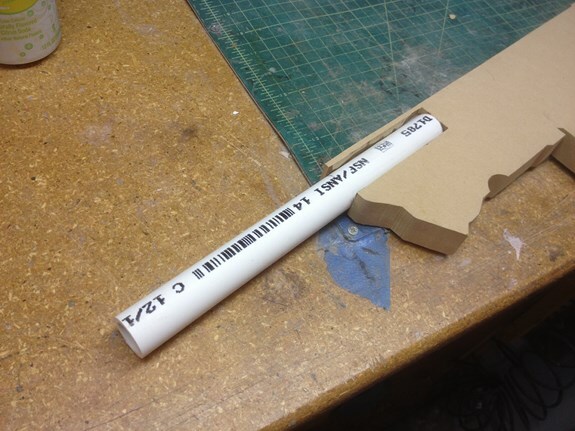 The front barrel pieces were assembled from different diameters of PVC pipe and dowel. 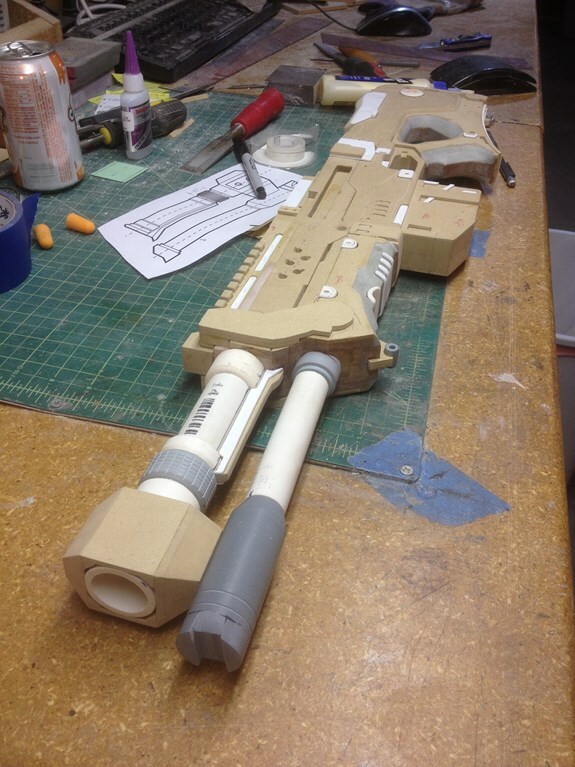 The gray, textured ring on the top barrel was a lathed piece of polyurethane plastic resin; a technique I used on several parts for this gun. 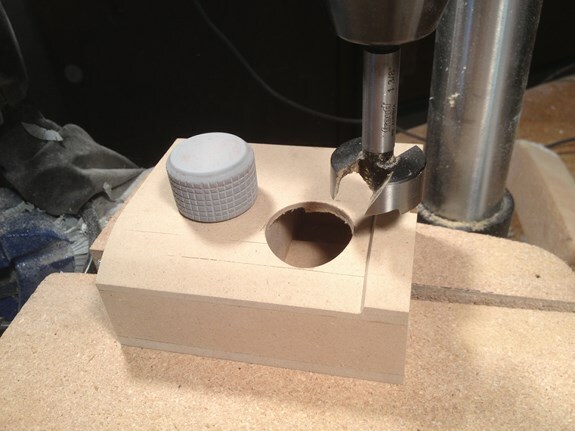 I also built a little MDF box to go around the top barrel piece. The bottom barrel piece was also lathed plastic. This barrel assembly was designed to receive the longer, front barrel piece so that it could be disassembled for transport. 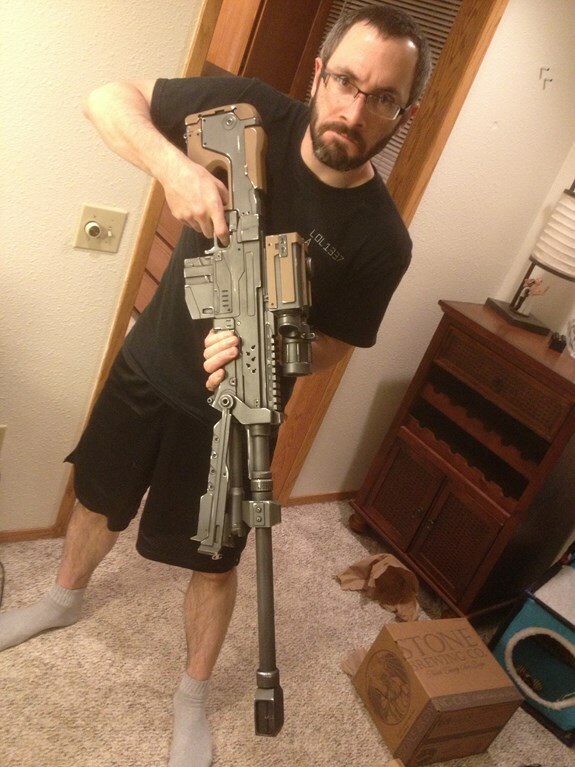 I designed the bipod pieces to be static and attached to the bottom barrel part. 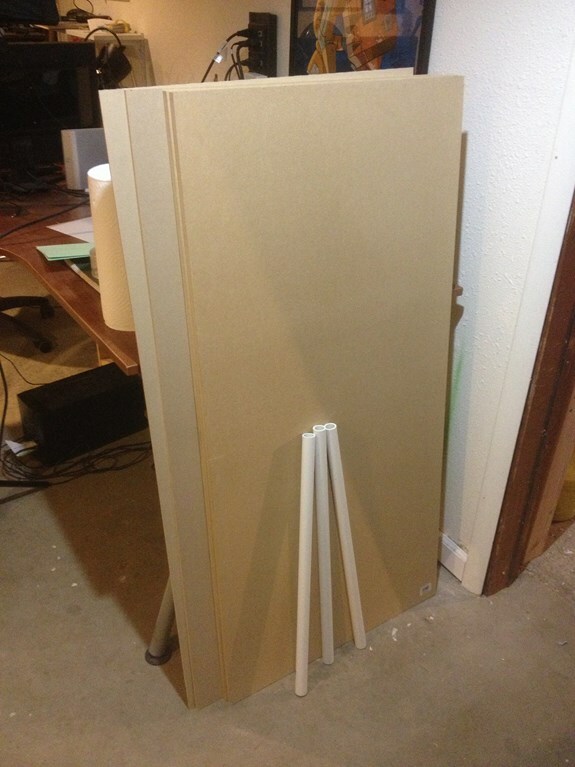 These were also made from layers of MDF and styrene (go with what you know). The scope was a particularly challenging part. 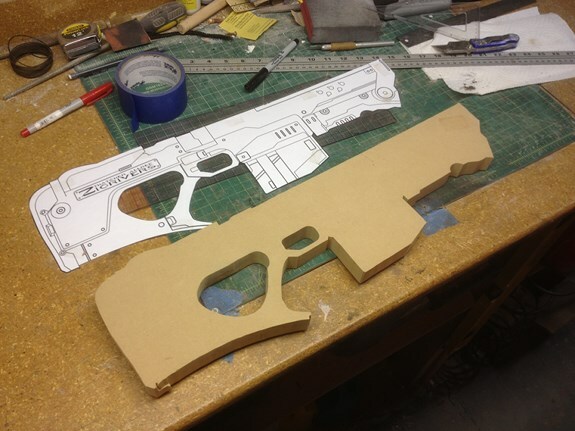 Most of it is just a box made from 1/4″ thick MDF panels. I had to curve one side of it though, so I made several faceted pieces and glued them down. 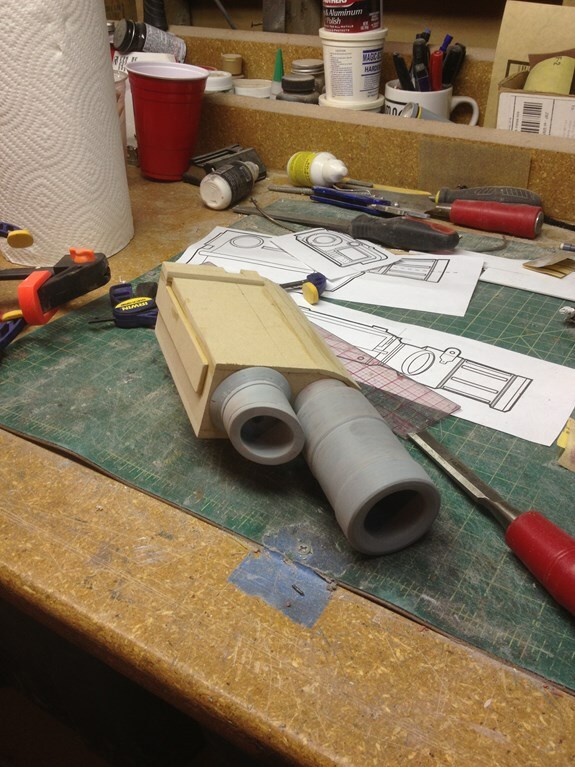 The actual scope pieces were lathed from polyurethane plastic. Note: whenever I’m casting pieces, I pour extra resin into cups and keep these to use as blanks for lathing. 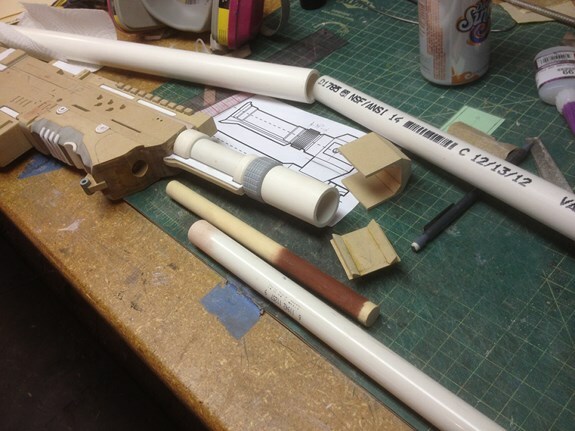 Most of the detail pieces in the scope, barrel, and body were done in thin styrene. 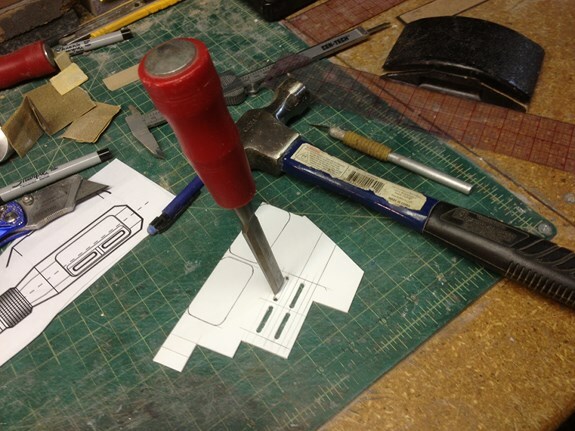 Sometimes it’s a pain to cut without something like a laser cutter, but I make due. 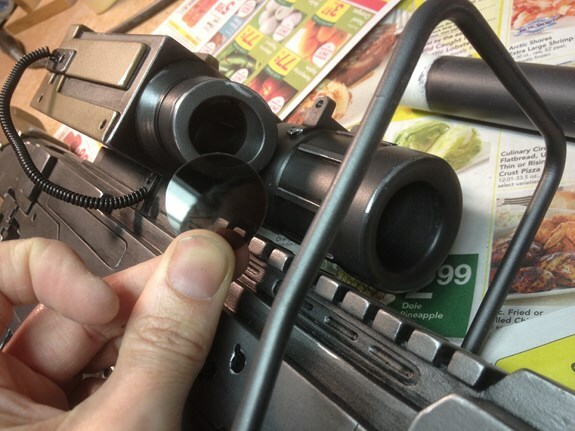 More lathed plastic for the top knob on the scope. There’s a weird bar thing over the body of the gun. 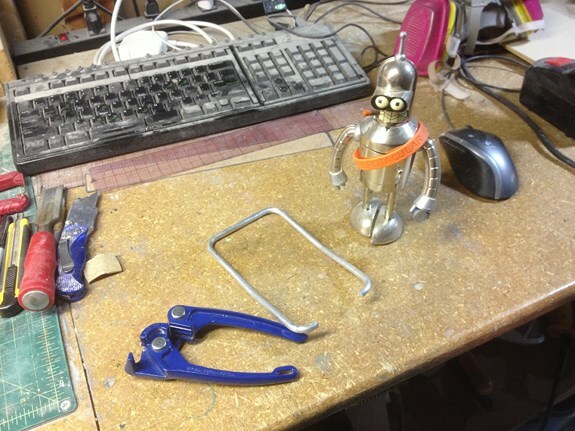 I made it from a piece of 1/4″ diameter aluminum rod with my bender. And my Bender. 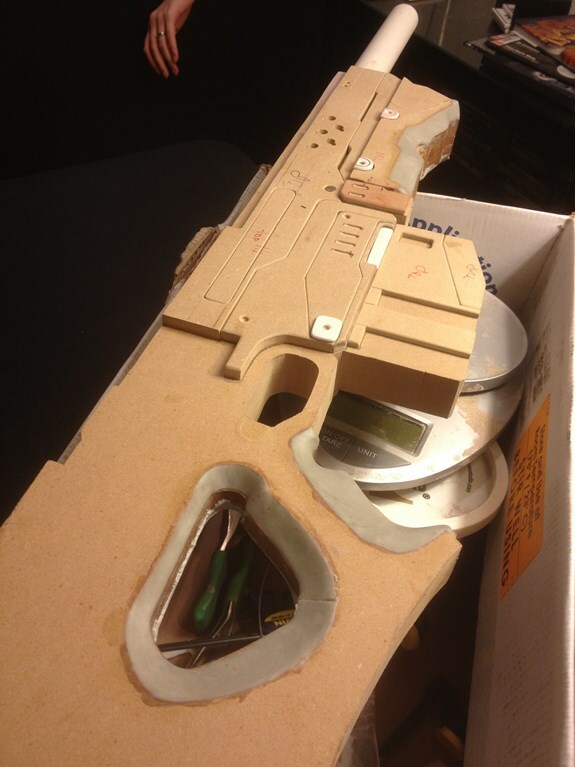 To seal most of the MDF, I used a lot of filler primer. I ended up doing a couple of coats, sanding it, then doing some more coats. 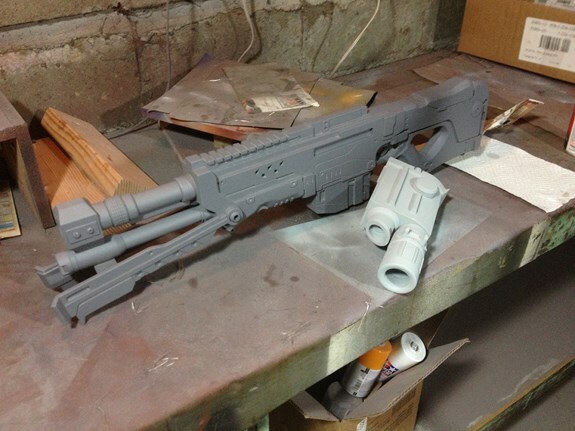 Then it got primed for paint. I painted most of the gun with an airbrushed gunmetal buffable metalizer lacquer. The brown handle bits are just airbrushed enamel paint. I finished off the piece with some smoked acrylic circles in the scopes!